Double-sided mirror with normal and 3 x magnifying.360-degree swivel design and can be fixed at any angle you like.Excellent quality with brass material, rustless,anticorrosive and durable.Ideal for applying make-up,wearing contacts and shaving,etc.Elegant design，would be suitable for any family and hote bathroom,etc. Mirror surface is 8 inches.The arm is up to 12 inches, can be extended according to your need.All metal construction with polished chrome surface.Easy to install，comes complete with screw fixings.Mirror diameter: 8 inches (20cm)The arm can be extended up to 12 inches (30cm).Material:Brass and high polished ChromeColor:silverWeight: 0.9kgpackage1x wall mounted mirror1x pack of fixing screws Brand Unbranded MPN Doe. Crystal Magnifying MAKE-UP MIRROR Embellished With Swarovski CRYSTALS. BRIGHTEN UP YOUR BEDROOM/BATHROOM WITH GORGEOUS SWAROVSKI CRYSTALS. NEW AND UNIQUE TO US HERE AT COUTURE CRYSTAL. FOUR HUGE SS48 CLEAR SWAROVSKI CRYSTALS ON THE FEET. SIX SS20 CLEAR SWAROVSKI CRYSTALS ON EACH SIDE 24 IN TOTAL. SP Hepburn Mirror 500mm. W: 500mm H: 700mm 500 x 700mm mirror|5mm mirrored glass|450 x 110mm glass shelf with chrome fittings|Includes fixings|10 Year Guarantee . Bathroom wall mounted mirror feature: *Double sided Wall-Mounted Mirror, 1X and 3X with no distortion. *Square mirror Measures 6-inches by 8-inches,Extends 9" from wall. *Brass and chrome polishd protect against moisture and condensation. *Could fold back against the wall when not in use, do not take up the space of counter. *360ｰ Swivel Design:180 degrees on base arms and swivel a whole 360 degrees inside a frame. *Come with 5-year warranty, friendly customer service. LIGHTED VANITY MIRROR. 4" ROUND MIRROR WITH STAND. 10X MAGNIFICATION. LIGHTED MIRROR W/ STAND, BATTERY OPERATED 10X MAGNIFIER. BATTERY OPERATED (INCLUDED). Conair Double-Sided Lighted Makeup Mirror - Lighted Vanity Makeup Mirror. As compared to Conair's incandescent lighted mirror. 7x / 1x Magnification. This stylish tabletop mirror features a slim profile and bright, LED lights for effortless visibility in any lighting condition. Sabichi LED Mirror. Keep your bathroom organised with an extensive range of bathroom accessories by Sabichi. Adjustable Angle. ONE SIDE NORMAL MIRROR ONE SIDE 3X MAGNIFYING MIRROR. Double-sided mirror with normal and 3 x magnifying. IDEAL FOR THE BATHROOM OR BEDROOM. " DOUBLE SIDED EASY TO TURN ". SHAVING MIRROR AND MAKE UP MIRROR. Novis double arm pivotal mirror with one side plain and other side x3 magnification. Classic design with concealed fixings. Employing a high quality plating process to ensure a flawless finish. One side plain mirror and Magnification X3 on other. Sabichi Vegas Mirror. Keep your bathroom organised with an extensive range of bathroom accessories by Sabichi. 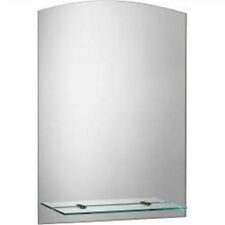 This mirror will add a touch of style to any bathroom. Vegas Mirror. Sabichi Miami Mirror. Keep your bathroom organised with an extensive range of bathroom accessories by Sabichi. This mirror will give a luxury look to your bathroom. Miami Mirror. ONE SIDE NORMAL MIRROR ONE SIDE 3X MAGNIFYING MIRROR. SHAVING MIRROR AND MAKE UP MIRROR. YOU WILL NEVER MISS THAT SPOT WHEN SHAVING. IDEAL FOR THE BATHROOM OR BEDROOM. " DOUBLE SIDED EASY TO TURN ". So, give us a try and we are confident that you will be back for more. Helpful Links. Our policy at My Beauty and Care is to process and despatch orders within 24 hours to ensure your goods get to you safely and quickly. Double-sided mirror with normal and 3 x magnifying.360-degree swivel design and can be fixed at any angle you like.Excellent quality with brass material, rustless,anticorrosive and durable.Ideal for applying make-up,wearing contacts and shaving,etc.Elegant designï¼would be suitable for any family and hote bathroom,etc. 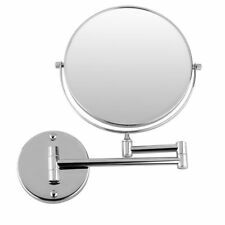 Mirror surface is 8 inches.The arm is up to 12 inches, can be extended according to your need.All metal construction with polished chrome surface.Easy to installï¼comes complete with screw fixings.Mirror diameter: 8 inches (20cm)The arm can be extended up to 12 inches (30cm).Material:Brass and high polished ChromeColor:silverWeight: 0.9kgpackage1x wall mounted mirror1x pack of fixing screws Brand Unbranded MPN Doe. Blends quality and durability with elegant style. -- Equipped with drip-free ceramic disc valves for long life and smooth feel.